It's been cold (for the summer) and rainy the last few days so yesterday I made potato leek soup. Alex bought leeks for a mushroom dish he made the other day, so I snagged one and made soup with it. I'm tired so this will be short! 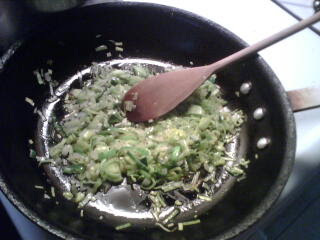 Melt the butter in a saucepan, then cook the leeks. I may have added garlic and a little bit of onion, but thats up to you. Cook the leeks until they are soft but not brown. 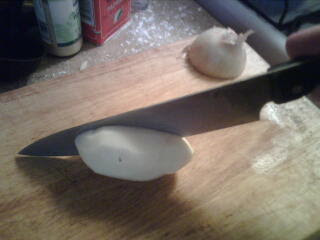 Cut the potatoes in half, then in half again, then slice thinly. Dump potatoes into a pot with chicken stock (I used about 3 cups then added water later on) and add the leeks. 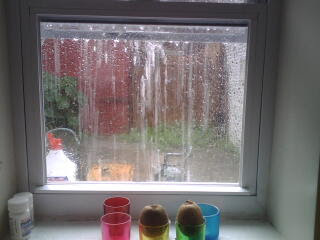 Cook an hour or two, until the potatoes fall apart. Strain most of the solids into a food processor or blender, and puree until smooth. Add these back to the liquid and cook another 20 minutes. Turn heat to very low and add cream, taking care not to boil the soup. These are like you ate before you stopped eating gluten at a Chinese restaurant. I periodically examine all the weird flour mixes at the Asian grocery store by my house to see if there is anything of interest that is gluten-free. One day I found this mix for dumplings called Ha Cao. I think it is Vietnamese, the instructions are terribly translated, but with a little bit of fooling around and adding more white rice flour I was able to make perfect, doughy dumplings just like I loved pre-gluten free life. I wasn't able to find them on the internet right now, and later I will post a picture of the wrapper and look harder, but I hope they carry them at your Asian grocery store. To make the dumpling wrappers, you mix the flour with an equal amount of water, heat it a little (until "half cooked") and then add some oil, and it should magically turn into workable dough. That isn't the case for me, so I add more rice flour by the tablespoon (today I added 6) one at a time, until I have a good consistency. Then, form a little ball, pinch it flat, fill, and pinch the ends closed. I line all the dumplings up on cookie sheets and freeze most of them (one 79 cent bag makes about 5 dozen dumplings) and then put them in bags for later, and cook some right away in a little bit of oil, uncovered until the bottoms turn brown and then I turn them, cover them, and wait a few minutes. They're done when all the dough is transparent. Make a dipping sauce from soy sauce (wheat-free, of course), rice wine vinegar, ginger, scallions, chili oil, sesame oil, whatever else you feel like. 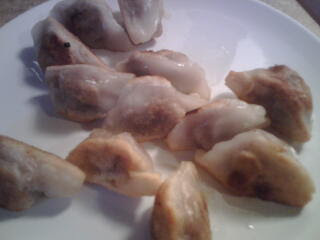 The filling for the dumplings always ends up being beef, because I hardly have ground pork in the house. I mix beef with ginger, garlic, sesame oil, chili oil, and a dash of soy sauce. I want to eat these every day. I also made a salad and a pie, but I'll write about those later. Now it's bedtime. I miss dumplings!! I used to make my own, and haven't..now I have hope. Thanks for the GREAT find!!! I just found your site last night and have been "pinning" a ton of recipes to try. Do you remember the brand of the dumpling mix. When I google "gluten free Ha Cao" dumpling mix I get all sorts of things. I miss dumplings horribly.